During his routine flyover above the Arctic ocean this month, John Sonntag, a NASA scientist, got stunning photographs of mysterious ice holes in the Arctic, particularly located on the surface of the eastern Beaufort Sea. This is the first time scientists have photographed holes of this kind, which is why determining what the holes are and where they came from is quite challenging to them. According to the report, the holes were located about 50 miles northwest of Canada’s Mackenzie River Delta. The trip itself was a part of a mission which makes observations of the northern sea and sea ice. However, it wasn’t too long before the mysterious, unexplainable, holes came to be the center of focus for this trip. Nathan Kurtz, a fellow IceBridge project scientist provided his explanation of the strange holes. He noted that based on the images, the holes are located in an area where the ice is thin. However, he can’t determine what caused the holes and how they got there. “I’m not sure what kind of dynamics could lead to the semi-circle shaped features surrounding the holes. I have never seen anything like that before,” said Kurtz, reported by NASA. 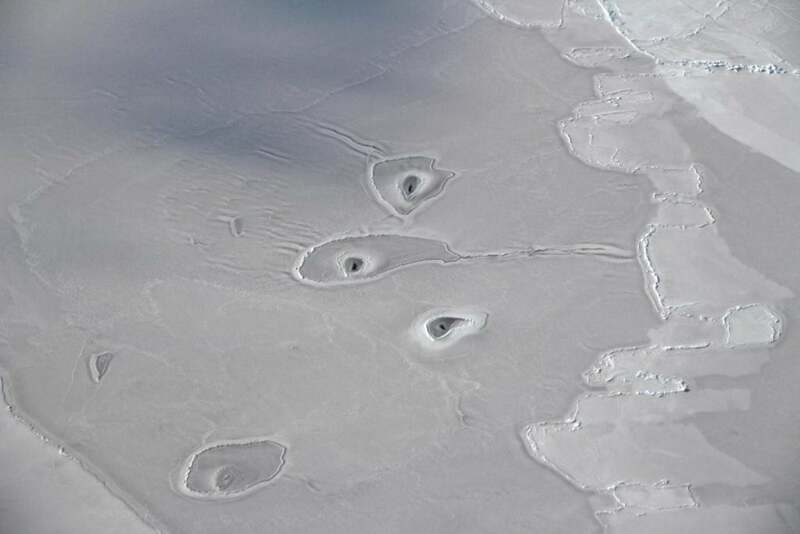 There are several other suggestions concerning the mysterious ice holes provided by Walt Meier, a scientist at the National Snow and Ice Data Center. Chris Shuman, a University of Maryland at Baltimore County glaciologist based at NASA’s Goddard Space Flight Center, on the other hand, provided his own version for the holes, suggesting that it could be warm water that is melting through the Arctic ocean sea ice, either coming from warm springs, groundwater coming from the mountains on the land, or there could be several sea currents that are somehow managing to get to the surface. At the moment, it’s quite difficult to determine what caused the holes only with a photograph. There are even thoughts suggesting that they were made by seals that wanted to make an open area in the ice which they can use to get to the surface to breathe. Nevertheless, scientists will gather more information and eventually learn what caused these strange holes.